It has been a couple of years since I last caught Tull on tour and the anticipation since buying the tickets for this concert has been immense. Last year was a bumper year with three Tull related releases, Ian Anderson's - Rupi's Dance, Martin Barre's - Stage Left and The Jethro Tull Christmas Album. Regular readers of the DPRPages may have noticed a certain fondness for this band within those reviews, so this concert was the icing on the cake, so as to speak. I have to say that Tull are a band that has crept up on me over the years, as to my shame I pretty much ignored the band until the release of A. 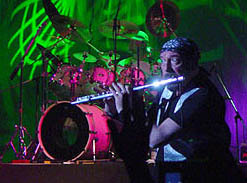 Since then I have been making amends, and now Tull feature very much in my top ten bands. Sadly I missed the entire support as I stood chatting to friends, in the rather crowded and the very loud theatre bar, whilst waiting for the bell announcing the band were due on stage. So it was only at about 8:15 when the bar became even more over-crowded that I realised from the chatter of those just arriving, that I had missed part of the evening's performance. A very good support indeed! Anyway, having taken my seat behind the tallest person in the theatre (nothing new here, I thought) the lights dimmed and the band opened up with Living In the Past much to the audience's pleasure. In fact the early part of the performance featured music from Tull's earliest days, even the pre Martin Barre era, This Was being featured. Musically the band was on top form and I also noted a more relaxed stage atmosphere than I had remembered, with Ian Anderson's humorous rhetoric as entertaining as ever. Regaling stories and memories of a former bearded, pipe smoking ex-band member whose recent gender change had caught the media's attention recently, as David Palmer is no longer David, but now Dee Palmer. Ian also mentioned Dave Pegg's "musical equipment sale" and impending impoverished state. However Dave did ask Ian to mention that his "divorce" would not affect this year's Cropredy Festival in August. Note for the diary that Tull will be appearing this year. Not so joyous was Ian's announcement that he had spoken to Jack Bruce's daughter and that his deteriorating health was of grave concern. Our wishes go to him and his family. The concert that went from the very old to the very new as several tracks were taken from the now not so seasonal The Jethro Tull Christmas Album (only 317 days to go till next Christmas). Firstly with the not so new A Christmas Song complete with projected images of snow flakes behind the band and later followed by excellent versions of God Rest Ye Merry Gentlemen, Holly Herald and Weathercock - none of which seemed out of place in mid February. Gabriel Fauré's Pavane also captured one of the more delicate and touching moments from the evening. Two tracks were featured from Ian's latest solo album Rupi's Dance, with Eurology and A Week of Moments. Martin Barre's feature (as memory serves me) was not taken from the new album. One of the highlights of the evening had to be a medley of songs from my favourite Tull period, and consisted of the title tracks from Songs from the Wood, Too Old to Rock and Roll, Too Young to Die and Heavy Horses. Wonderful to hear these tracks live was again, especially Songs from the Wood, which they could have played in its entirety for me. Willy Porter (who I had missed earlier) made an appearance on stage to add the backing vocals to these tracks. Other old favourites also appeared with the much loved Aqualung, a track I have never tired of over the years, and judging the audiences reaction neither had they. An attempt was made by the PA crew to mimic the sound used on Anderson's voice during the early verses, sadly this just made the lyrics inaudible and unintelligible. A New Day Yesterday followed this and by which time the band was definitely "cooking on gas". Anderson's flute work was as exemplary as ever and Martin Barre for me has matured into a wonderful guitarist, his parts so complimentary to the overall sound (as of course they should be). Doanne Perry was as solid and creative as ever with Jonathan Noyce, who still looks a little uncomfortable on the stage lending some great bass work. Andrew Giddings is surely a star in his own right, as not only are his parts superbly played, but visually he is a joy to watch, the man just exudes charisma. A wonderful evening of music and most heartening was that the concert was "sold-out". A few younger faces would have been welcome but let's not be greedy. 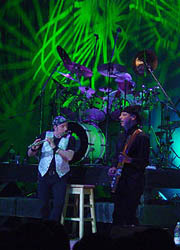 For those who have not witnessed a Tull concert, then all I can tell you is that you are missing five great musicians who are able to deliver their complex musical arrangements, set amidst a warm and relaxed atmosphere and with a liberal dose of humour. The end of the evening and the customary "balloon" bouncing was accompanied by a little rendition from A - perhaps to mark release of the Slipstream DVD and rereleased A album. I have not included a setlist as I am invariably inaccurate with these matters and despite typing up this review only an hour or so after the concert, tracks and the order in which they came had merged together and my mind started to play tricks - including the usual adding of material not featured.